Cara Black Nest of Tables. 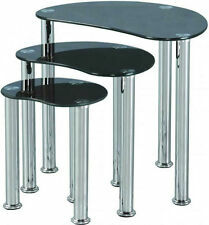 The coffee and nests of tables are available in clear or black glass. Try to use the product only for it's intended purpose. Living room furniture for example is not designed for outdoor use. 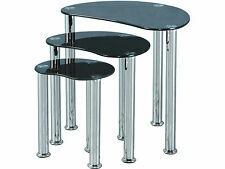 Cara Nest of Tables - Black Glass & Silver. The Cara range also features a matching Coffee Table and is available in Black Glass. Large Table Small Table. 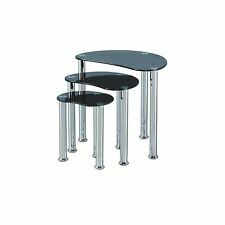 Sleek black glass surfaces Reflective chrome metal legs Contemporary nesting tables Floor-protecting feet Dimensions (W x D x H): 48 x 48 x 43cm . Logan Black Glass Nest of Tables. These three tables can be neatly tucked away with the smaller tables inside the larger one. 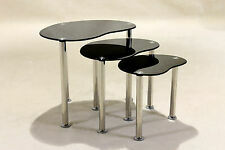 The Logan three piece table set has been manufactured with tempered black glass. The Cara glass nest of tables comprises of a set of three matching tables that slot neatly together and can be separated to provide extra space. The Cara black glass nest of tables features a toughened glass top 6mm thick, a beautiful oval design that will look excellent within contemporary decor modes and uniquely rounded polished stainless steel legs. Top table size :approx. - W52.5cm x D39.5cm x H48cm = (W20.5" x D15.5" x H18.5"). The Carla nest of tables is an attractive and yet solid & Sturdy nest of tables which is set in a really lovelyblack glass and silver. Top table size :approx. - W52.5cm x D39.5cm x H48cm = (W20.5" x D15.5" x H18.5"). The Carla nest of tables is an attractive and yet solid & Sturdy nest of tables which is set in a really lovelyclear glass and silver. 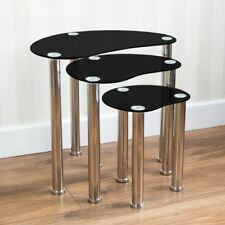 Cara Nest of Tables - Black Glass & Silver. Large Table Small Table All of our furniture is of a good quality so rest assured that your item will represent value for money without compromising on quality. Set of 3 brown coffee nesting tables brings you stable comfort both indoors and outdoors with its clean and natural design. The table legs are steady and allow a good tight when objects are on top such as books, coffee mugs, etc. 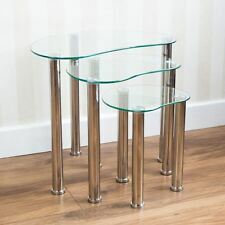 The Cara glass nest of tables comprises of a set of three matching tables that slot neatly together and can be separated to provide extra space. The Cara clear glass nest of tables features a toughened glass top 6mm thick, a beautiful oval design that will look excellent within contemporary decor modes and uniquely rounded polished stainless steel legs.